Parade Line-up location: Blue Cross Rd south of Yankee Doodle. You must enter line-up from the south via Blue Cross Rd. via Blackhawk (NOT Yankee Doodle via Hwy 13). See route and lineup map here. Special Attire Note: In addition to your regular uniform, feel free to accessorize yourself or your unicycle with red, white and blue! 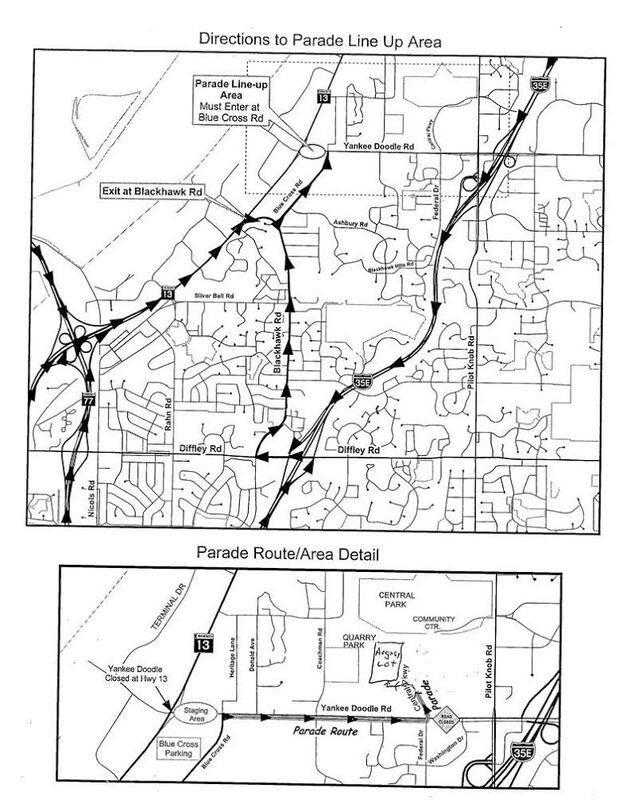 Parade Route: Yankee Doodle from Blue Cross to Central Parkway and turn left to parade end. Argosy parking lot will be used for dispersal. See route and lineup map here. There is no extra parking at the line-up location. To park at the end, there should be plenty of parking at the community center or one of the business lots that they allow parking in. There isn’t much residential parking near the end, but to the south of Yankee Doodle on Federal and streets off of it there may be some on-street/lot parking available.